Wonderful display cakes. Use as a memento from your wedding for photo sessions, add your own floral and change with the seasons. 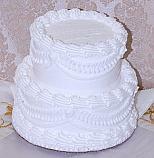 Fake Wedding Cakes, For up coming weddings browse our assortment fake wedding cakes. Excellent Wedding Souvenir or Wedding Guest table center piece. 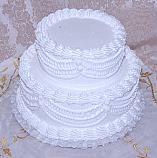 All of our Fake Wedding Cakes are hand made just like a real cake using our artificial icing dispensed through a pastry bag to decorate the cake. Made with Pride in America.